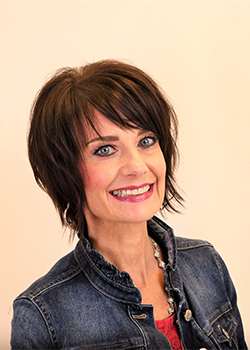 Meet Janie Orf, hairstylist and special occasion makeup artist at Illusions Salon. She's enjoyed helping women look and feel beautiful for over thirty years, in Oklahoma , Hawaii, and here in Colorado. Beginning her seventh year here at Illusions Salon! She love's cutting, highlighting and coloring hair, using Joico's Vero color line. Also, if you have a special occasion coming up, she'd love to help you get your makeup just right! Janie is available for appointments on Tuesday's, Thursday's, and Friday's, and she looks forward to enhancing your beauty! She has freelanced as a make-up artist for several cosmetic lines, and a photography studio, in addition to being a stylist. She was inspired by her Mother, who was a stylist in the 1960-70's. There was also a childhood friend, who asked for Janie's help with hair and makeup, while they were both in high school. "When I curled her hair, and put a little makeup on her, it changed her confidence level, and how she carried herself! When she felt good about how she looked, it changed her on the inside!" Janie strives to help women not only look their best, but feel good about who they are. She has enjoyed being a stylist and special occasion makeup artist at Illusions Salon And Spa since 2011.